* Fully redundant & hot pluggable designs: RAID controllers, power supplies, fan modules, battery backup modules, & JBOD expansion. * Two (2) 10GbE iSCSI ports & Two (2) iSCSI ports per controller. * Hardware iSCSI offloaded engine. * Green storage designs: auto disk spin down, advnced cooling mechanism, & 80 PLUS energy-efficient power supplies. * Advanced data protection: RAID6, 60, Opslag writeable snapshot, windows VSS support. *Flexible volume management for multiple application & environments: (VMWare, Hyper-V, Citrix support), cloud, storage, SQL, Exchange, Surveillance, file backup, email, boot from SAN, & etc. * High connection availability: load balancing & failover. * Extendable capacity up to 192 hard drives. D2-QIT 10GbE iSCSI system is specially designed for high availability applications. 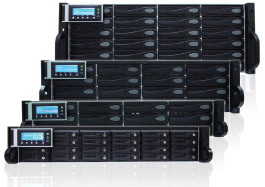 The D2-QIT has fully redundant components including redundant RAID controllers, power supplies, fan modules, battery backup modules and SAS JBOD expansion ports. All of these components are hot-swappable to create a high availability platform and provide non-stop services. Special features in firmware are RAID 6, 60 support, Opslag writable snapshot, Windows VSS support, volume cloning, QReplica remote replication, and volume configuration restora tion. All these features are designed to add an extra layer of protection to your valuable data. To raise the bar higher, D2-QIT can upgrade firmware without system down time. Both firmware image and volume handling are well protected by the redundant RAID controllers. When one RAID controller is down or disconnected, the other RAID controller will take over all tasks immediately and seamlessly. The D2-QIT’s powerful RAID controllers provide much higher IOPS and throughput than other storage systems within the same segment in the current market. The D2-QIT can minimize your cost and optimize your investment, simplify storage planning, and integrate more applications. The optimized IOPS and throughput are capable of providing run-time critical online services, such as Cloud storage, SQL, Exchange, and high-end surveillance storages. Furthermore, with the 10GbE iSCSI interface, D2-QIT is ideal for virtualization environments - VMWare, Hyper-V, and Citrix. Users can install up to 128 OSes in the 10GbE iSCSI system through the Boot-from-SAN feature. With this feature, the multiple OSes/Servers can be managed easily and well protected by Opslag’s advanced data protection features, and there will be no system downtime caused by single point of failure. All D2-QIT system has Opslag default power saving feature. In most cases, the hard drives consume most power. With the auto disk spin down feature and proper configuration, the power consumption of hard drives can be reduced to a minimum, and users will not even notice this feature. D2-QIT monitors the environment temperature for cooling mechanism and the fan modules respond accordingly. The power supply modules are all 80 PLUS power efficient for better power converting rate. In virtue of the reduction of hard drive power consumption, the advanced cooling mechanism, and the energy-efficient power supplies, we can use energy more efficiently and reduce unnecessary carbon footprint. The D2-QIT systems are built-in with Opslag’s highly reliable data protection features, from writeable snapshot, volume cloning, to remote replication. Your valuable data can be easily safeguarded and synchronized locally and remotely. In case of accidents, data corruption, virus, and even disasters, the services and applications can be recovered in a very short time.